Tivat is located in the central part of the Bay of Kotor. It has a small Airport and a super marina yacht harbour, Port Montenegro. Tivat is also the youngest town in the Bay of Kotor. If you have a beach holiday in Budva area, you can make a day trip there. The driving time is about half an hour. According to Wikipedia, Tivat had different names in history. There are several opinions about how its name was called. 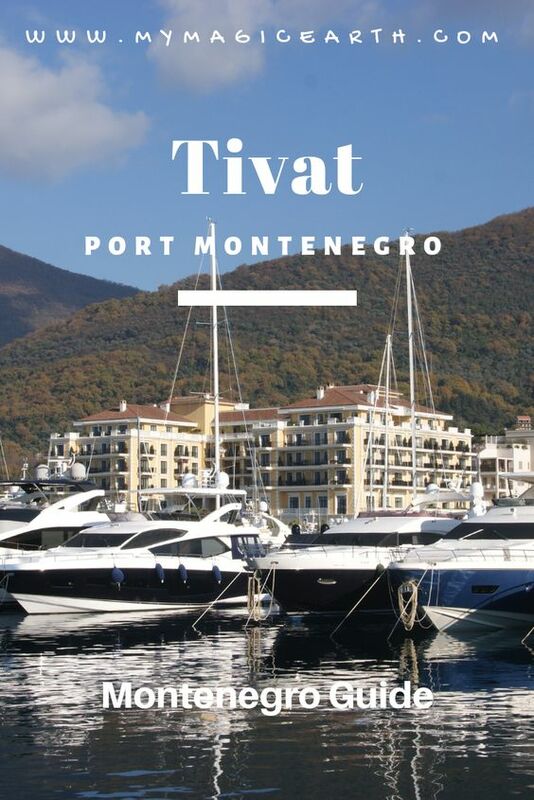 The common opinion says, that, the name Tivat comes from the Celtic word “teuto” meaning town. The interesting part is its development in recent years. Because of its typically Mediterranean climate, the modern development has turned Tivat to a new tourist destination. The Regent Hotel is the first 5-star hotel in Montenegro. The hotel has a breathtaking design inspired by the Venetian Renaissance. It is in the center of Port Montenegro. We have stayed there seven nights during our Montenegro road trip. We had enjoyed the gourmet cuisine from its breakfast buffet and cooked breakfast, such as scrambled eggs with Croatian truffles. The spa includes modern fitness equipment, relaxation room, showers, sauna, steam room, and more. It offers the breathtaking views of the magnificent Mediterranean. In the winter season there were only a few guests. Most of the time, our family was the only guest using the entire spa area. It was a purely affordable luxury experience. This is also a perfect place for a weekend escape or a honeymoon. You can find the hotel at www.HotelsCombined.com. On Tivat Riviera, there are 17 nicely arranged beaches. Even you are the pickiest swimmer, you would find one to satisfy your need. Tivat has on average 240 sunny days a year. That’s why it attracts many tourists in the summer. Porto Montenegro#s state-of-the-art marina utilizes the existing infrastructure of the former Yugoslav naval facility. It Is home to luxury yachts, including the largest super yachts, and provides the highest level of service and amenities for vessels of all sizes. During our stay, we spotted a super yacht owned by a well-known person from Saudi Arab docking there. The development created a vibrant coastal community of hotels such as Regent, restaurants, shopping, and other leisure activities. One day, before the sunset, we took a pleasant walk along the waterfront. We saw so many new shops which were selling world famous brands. Near the harbour quarter there were high standard residences. Many restaurants and bars situated next to each other. Some even require dress-code for the evening. Walking along the nicely paved promenades, we did enjoy wonderful harbour views in the sunset and a coffee break in one café. There are plenty of places where you can taste the Mediterranean cuisine as well as international cuisines. You can choose between fish restaurants which serve fresh fish dishes and seafood, along with some good wine, or taverns and pizzerias. Most of the eateries are affordable. Check some review at www.tripadvisor.com. Other than the Regent hotel, there are several small hotels in the town. Most of their offers are reasonable. They are also located within a short distance to the waterfront. There are plenty of accommodations in the neighbouring suburbs as well. Please check the following platform to find a good offer. Tivat Airport (TIV) is the closest airport to Tivat. The airport is only a few kilometres away from Port Montenegro. There are buses from Kotor to Tivat. There are also buses from Dubrovnik. Please check here for the time table.